Ryne Willard hit his third home run of the postseason. The Big Train hosted the Alexandria Aces on Friday night, as both teams hashed it out for the chance to play the Baltimore Redbirds in the CRCBL Championship on Saturday night. Brock Larson (San Francisco) got the start for the Big Train, and gave the team six solid innings of one-run ball. Larson recorded four strikeouts, throwing 60 of his 92 pitches for strikes. In the bottom of the third inning, the Big Train would draw first blood. 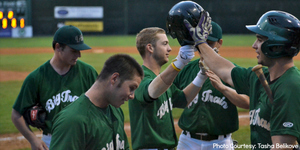 For the third time in as many games, Ryne Willard (Tallahassee CC) came up with a clutch home run for the Big Train, this time a two-run shot that put the Big Train up 2-0. In the fourth, the Big Train would extend their lead, as an RBI single from Mike Miedzianowski (High Point) scored Johnny Cole (Coastal Carolina) from second base to make the score 3-0. Two innings later, the offense would add some cushion to the lead. With runners on second and third, Kevin Tatum (Cornell) hit an RBI single to push the lead to 4-0. However, there's no such thing as a safe lead in the playoffs. In the top of the seventh, the Aces would rally, scoring four runs off the Big Train bullpen to pull the score back even. But the Big Train would answer in the bottom of the eighth. Johnny Cole would lead off the inning by drawing a walk, and would then advance to second base on a sac bunt by Mike Miedzianowski. After a walk to David Del Grande (Sacramento State), Ty France (San Diego State) would come up to the plate with runners on first and second and one out. France would hit a single that was deep enough to give Cole a chance at scoring from second base. While Cole appeared to be out at the plate, Aces catcher Bobby Burns dropped the ball, allowing the run to score and the Big Train to take the 5-4 lead. Will Resnik (High Point) would come on to pitch the ninth, and pitched his second no-hit inning to pick up the win and send the Big Train to the CRCBL Championship for the third consecutive year. Friday night's victory sets the stage for a rematch of last year's league championship, as the Big Train will once against square off against the Baltimore Redbirds. Game 1 of the championship will be at 7:30 tonight at Povich Field, as Justin Hepner (San Diego State) takes the mound for the Big Train. Because the CRCBL uses a double-elimination format, the Redbirds (3-0 in the playoffs) would clinch the championship with a victory, while the Big Train (2-1 in the playoffs) will have to win tonight and tomorrow night. Both games will be played at Shirley Povich Field, so come cheer on your Big Train at home for the final times! Tickets can be purchased here or at the gate! © 1998-2019 Bethesda Chevy Chase Baseball, Inc. except where otherwise noted. All Rights Reserved.